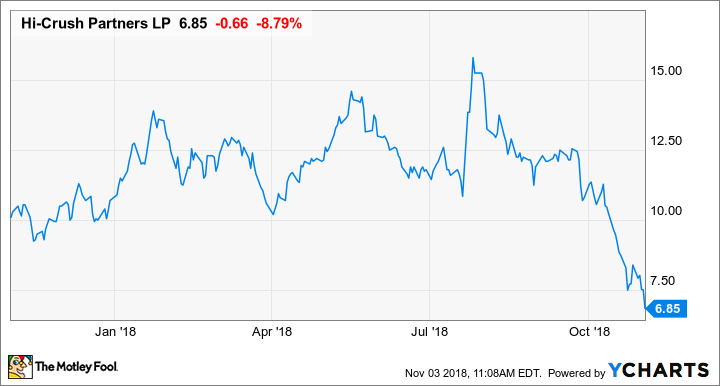 Does This Oil Stock's 20% Decline Represent a Buying Opportunity? Shares of Hi-Crush Partners have been hammered since announcing a corporate change and an earnings beat. The oil and gas business in North America went through such an incredible boom in recent quarters that it ended up becoming a victim of its own success. One of the casualties of that success this past quarter was frack sand supplier Hi-Crush Partners (NYSE:HCLP). With oil pipelines across the country running at capacity, producers stopped fracking wells, which of course led to a slight oversupply of sand that led to lower revenue and earnings at Hi-Crush. On top of the less-than-robust sand market, Hi-Crush is also in the midst of a major change to its corporate structure. It's a move that has people on Wall Street and those out to make a quick buck selling Hi-Crush's stock by the bundle. Ever since it announced its most recent corporate change, shares are down 21%. With all this going on, it's hard to tell whether shares of Hi-Crush are a good buy or not. So let's sift through the most recent earnings report and digest some of the recent news to see what to make of this frack sand stock. DATA SOURCE: HI-CRUSH PARTNERS EARNINGS RELEASE. EPS = EARNINGS PER SHARE. For as much as Hi-Crush's stock dropped since earnings, the company's results weren't that bad. It sold about 2.7 million tons of sand in the quarter compared with 2.4 million tons this time last year, and contribution margin per ton sold was a respectable $23.92. Yes, those numbers are down from the prior quarter's blowout result, but that was to be expected, as producers have drastically reduced the number of wells they are completing until more pipeline capacity gets built. One of the reasons that margins were relatively resilient this past quarter was thanks to its logistics services. Management noted that more than 45% of all sales were direct-to-exploration and production companies instead of to third parties like Schlumberger or Halliburton. Also, about 24% of all Hi-Crush's sand sold was through its PropStream last-mile service that generates much higher margins per ton of sand sold. These past six months have been incredibly busy ones for Hi-Crush. Last quarter, the company announced a distribution increase that would put the gears in motion to change its corporate structure from a master limited partnership to a C corporation. This quarter, though, it made an abrupt U-turn and announced a new way to move toward that corporate structure conversion. Instead of fulfilling a contractual provision with its privately held general partner, Hi-Crush announced this quarter that it will buy out its general partner's stake with common units valued at $96.25 million and eliminate those obligations. Concurrent with the buyout announcement, Hi-Crush dropped its payout from $0.75 per unit to $0.225 per unit. As you can imagine, the market didn't receive the news well and sent shares plummeting this past week. In the company's press release, CFO Laura Fulton discussed how its last-mile logistics services have helped to maintain profitability as the price for sand has declined in recent months. The increase in volumes sold through our PropStream logistics services and direct to operators benefited our sales volumes and, to a certain extent, our contribution margin in a challenging and rapidly evolving market landscape. In response to emerging pressures, we took proactive steps to control costs and concentrate capacity utilization at certain of our Wisconsin facilities, including our decision to idle the dry plant at Whitehall in late September. We continue to focus on improvements to our cost structure from the mine to the last mile, and on establishing and deepening relationships with operators. Our continued expansion of last mile solutions benefited our results in the quarter and positions us well to respond quickly to expected market improvements spurred by alleviation of demand constraints beginning in early 2019. Our integrated last mile solutions mitigated some impacts from the market and pricing dynamics of sand, as does our in-basin production capability. When Hi-Crush announced it was significantly raising its distribution in order to satisfy some covenants with its privately held general partner, the plan was to pay out distributions to make its general partner and allow it to start the process of converting from an MLP to a C-corp. For some short-term investors, the idea of picking up a stock that pays a yield near 20% for four quarters was enough of a reason to jump on board for a short time. This past quarter, though, the company pretty much squashed those distribution dreams by buying out its general partner's stake with shares. Now the company will pay a much more pedestrian yield, although after the recent share price drop, it pays a yield of 11.9%. Shares of Hi-Crush look absurdly cheap right now. Even though the industry is hitting a slow point, the company still sold 2.7 million tons of sand at a reasonable margin. We could see another quarter or two of weaker results, but the company is in a reasonable position to handle it. That said, the company is embarking on some significant changes to its corporate structure. When things like this happen, there's no telling what that means for current shareholders. The business itself looks good, and perhaps once it has completed its conversion to a C-corp it will be worth considering. For now, though, anyone not a current shareholder should probably sit on the sidelines to see how this shakes out.